From Customer to Chef in ten minutes! Regular volunteeer Lee arrived, as always with a smile on his face and a spring in his step. It is actually impossible to be moody around him and my frown started to clear. He got on with the jobs outside of the kitchen whilst I pottered about inside it, wondering what to make for the lunch menu. There were loads of veg (thank you Fruit Stall in Chapel Allerton and Organic Eastern on Roundhay Road!) but I was pretty uninspired as to what to do with it. 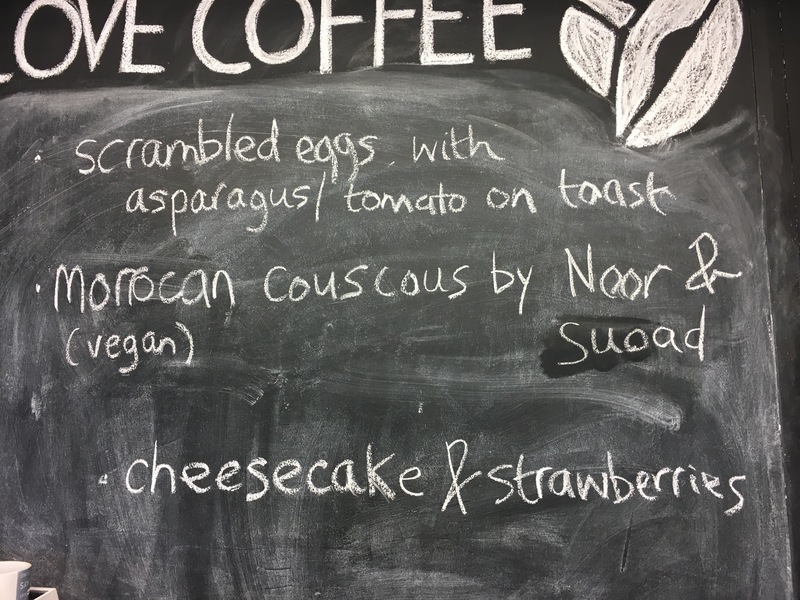 Our customers started trickling in; a couple of mums catching up after the school run, some students early for their English class next door, and a young couple who were new and were enjoying their breakfast in the back corner. So far, so good, but still no clear plan for lunch. It was too hot for anything big and heavy (soup always springs to mind with so many veg! ), and a salad was good but not going to be filling… we needed inspiration, and fast! I asked them for advice. They started explaining, in broken English, how to make the couscous (much more complicated than my normal home method of ‘pour on boiling water and cover with a plate’). I opened the spice drawer; a real hotchpotch of spices from around the world, donated from our equally global volunteers. They start sniffing and pulling out certain jars, rejecting others. Gina (another star of the TLC team who had popped in for a coffee), Lee and I looked at each other and grinned; could this be the moment we had secretly not even realised we’d been praying for? Gina cautiously asked if they would like to make the dish. Had we gone too far? No! They were delighted, rolled their sleeves up and got straight to work. It was an honour to see them working together, arguing over the size of the vegetables (! 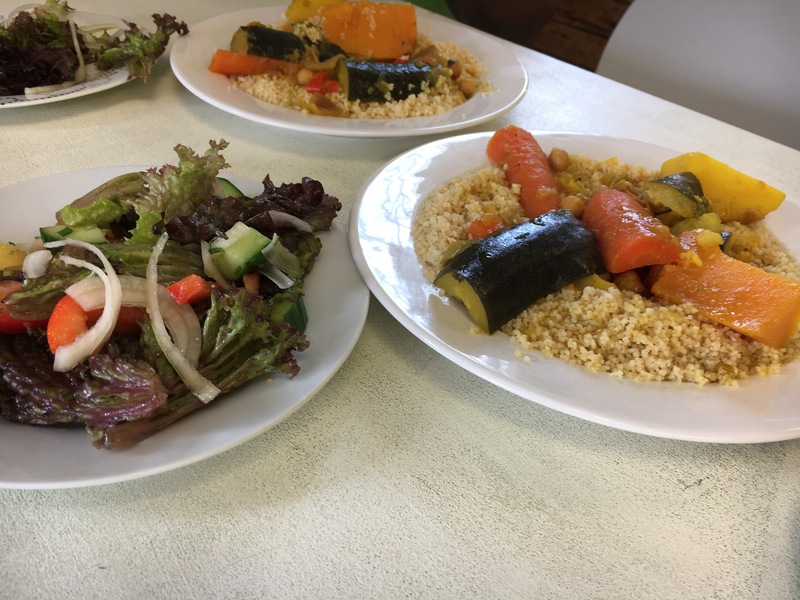 ), demonstrating the method of getting the best flavour into the steamed couscous, learning English as we try to establish the key ingredients that are missing for Lee to make a quick dash to the supermarket for them. 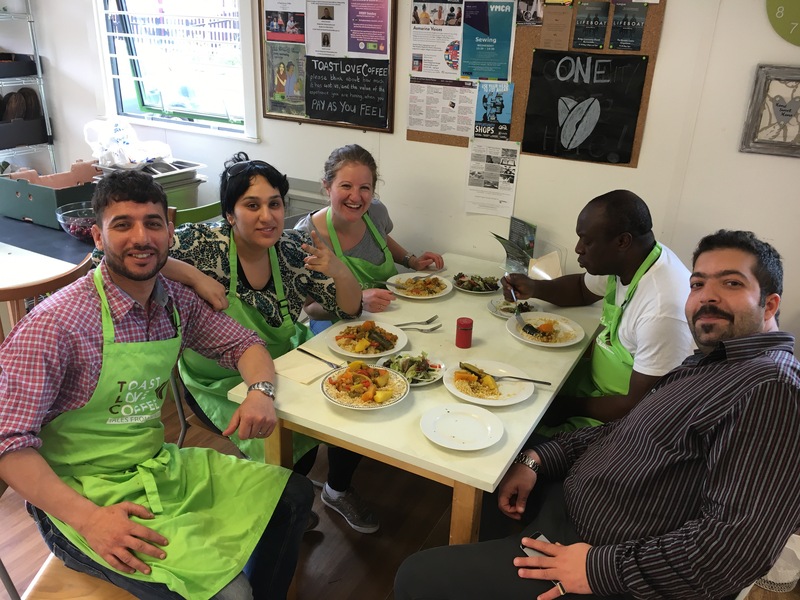 They worked so hard all morning, they produced the most amazing dish for lunch, they couldn’t stop saying thank you for welcoming them into our kitchen. We couldn’t stop saying thank you for gifting us such a treat. It really was one of those days today at TLC; Noor and Suoad, thank you, and welcome to the team! Thanks! Think it’s more of a demonstration rather than recipe. Seriously , it took about two hours to make! Oh I really wish I’d been there. It all looks fantastic. Recipes? Is that possible?